If you’ve ever felt a stiffness or pain in your hip, outer thigh, or outside of the knee, you’ve likely had a tight IT band. This often-neglected length of tissue is responsible for stabilizing the knee, and without proper maintenance, the band can stiffen and limit proper range of motion in all manner of movements including squats, deadlifts, box jumps, and even your ability to run. Let’s take a look at what the IT band is and how you can keep it functioning properly. The iliotibial (IT) band is a fibrous tissue or fascia that helps to stabilize the knee. It runs from the outside of the pelvis to the lower knee, and inserts at the top of the shinbone. While it is referred to as a “band”, don’t think of it as elastic. It actually isn’t very malleable; it is more like a leather belt. The IT band is filled with nerves. This explains why it is so sensitive to treatments like foam or lacrosse ball rolling. Several muscles tie into the IT band, and it may actually be issues with these muscles that are causing the pain sensation to manifest in the IT band. As with most of our bodies’ mechanical systems, the root of the issue is not always where the pain is felt. Often when the IT band becomes stiff, it rubs on the outside of the knee, causing pain. While there are movements that will help stretch the IT band that may cause relief of the pain and help to maintain its proper function, you should first look at possible causes of the pain. Otherwise, you are just treating the symptoms, not addressing the root cause. You should also resist the urge to ignore the pain in the IT band and continue training without addressing its problems. This route will likely result in you compensating in some way to reduce the pain, which can cause issues in other areas. IT band problems can be caused by hip, hamstring, or glute weakness or over pronation while running. Often the stress put on the IT band is the result of poor form. A coach or physical therapist can look at your movement mechanics and help diagnose the cause of the pain. Once you have determined the cause of the IT band stiffness and addressed those issues, you should begin a program of regular maintenance on it. 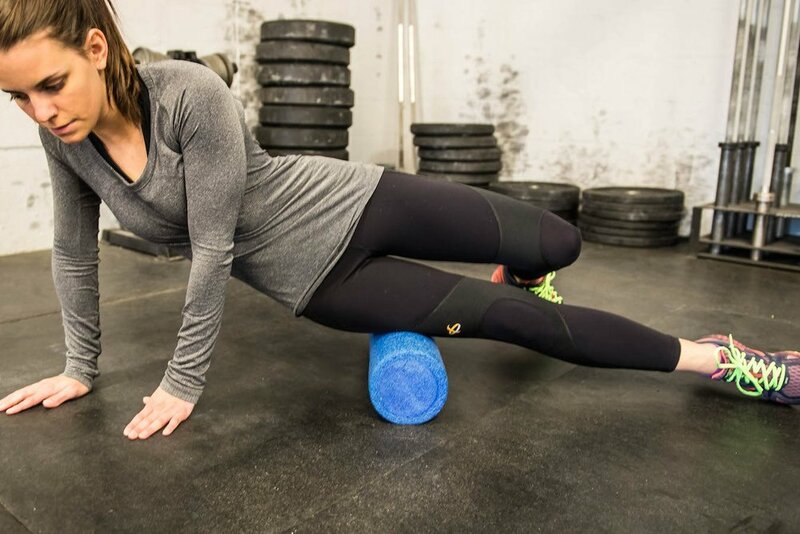 Always warm up the hips and knees first, and then you can incorporate these stretches into your mobility routine along with more traditional foam rolling. These are just a few of the stretches you can do to treat IT band pain and conduct regular maintenance on it. Proper IT band function is essential to so many other movements and you would be wise to do regular mobility with it. Dave and Amanda are always available to help determine the source of your problem areas and to suggest ways to fix them.